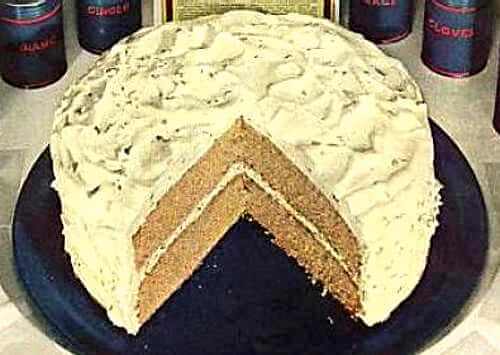 Enjoy this variety of old fashioned spice cake recipes, all traditionally flavored with either one or a mixture of two or more spices such as cinnamon, cloves, and nutmeg. When you bake them, the comforting aroma will make your kitchen inviting. 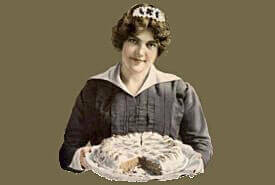 Frost or sugar glaze your cakes, or serve them plain for packing in lunches. 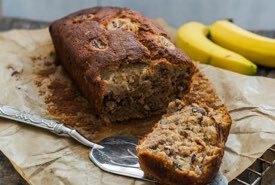 1/4 cup dates stoned and cut fine, 1/4 cup raisins cut fine, 1 teaspoon baking soda, 1 cup boiling water, 1/2 cup butter, 1 cup granulated sugar, 2 eggs, 1 cup walnuts (less will do), 1-1/2 to 1-3/4 cups flour, 1 teaspoon baking powder, 1/4 teaspoon cinnamon, 1/4 teaspoon cloves. Mix as usual and bake in moderate oven for about 40 minutes. Mix in order given above, and beat until no lumps remain. Bake in moderate oven (350°F) for 35 minutes in angel cake tin. Set oven at 350°F. Blend butter and sugar. Add eggs one at a time, beat thoroughly. Beat in preserves. Sift together dry ingredients and add alternately with milk to mixture. Beat thoroughly to blend. Stir in nuts and raisins. Pour into two 9-inch was paper lined pans. Bake 35 minutes or until done. Frost with your favorite lemon frosting. Cream shortening, add the sugar, gradually. Add the beaten egg yolks and beat hard. Mix and sift the dry ingredients. Add the soda and molasses to the sour milk. Add alternately with the dry ingredients to the first mixture, beating after each addition. Add the floured nuts and fruit, mixing thoroughly. Bake slowly (300° to 350°F) one hour. Cream a coffee cup of butter, with two cups yellow sugar and one cup black molasses. Add to it one after the other, seven egg yolks, beating hard between. When all are in, add one tablespoonful whiskey, or brandy, one teaspoonful grated chocolate, one teaspoonful each of powdered cloves, allspice, ginger, mace, and cinnamon, a grated nutmeg, and half a saltspoonful of powdered black pepper. Add also a pinch of salt, and the barest dusting of paprika. If whiskey is for any reason disapproved or unavailable, use strong, clear coffee instead, putting in two spoonfuls, and leaving out the chocolate. Beat all together hard for ten minutes, then add four scant cups flour browned in the oven but not burned. Sift after browning, adding to it two teaspoonfuls baking powder. Beat hard for five minutes after the flour is all in, then pour in a deep, well greased pan, lined with buttered paper. Heat oven, let it rise ten minutes with the oven door open, then close door and bake in quick heat until done through. 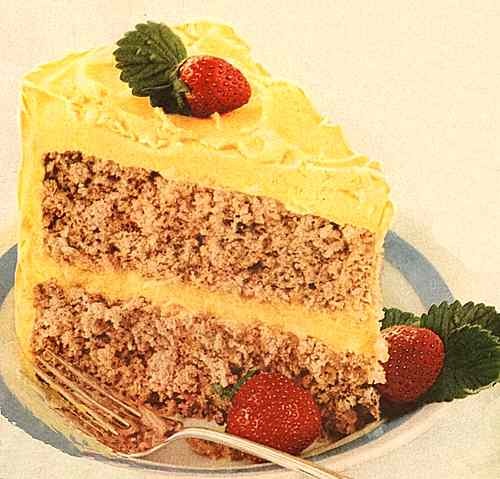 Spice cake is an old fashioned favorite, and this Old Southern homemade spice cake recipe makes one of the richest, most flavorful cakes you have ever tasted. Enjoy. 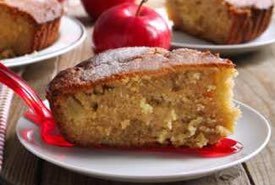 This recipe for apple spice cake was passed down from my Mom (who's in her 80s), and now my children make it for their families. Sift the first 9 ingredients together. Mix in the raisins and nuts. Cream margarine and sugar, and add eggs. Mix this into the dry ingredients, together with the applesauce. Turn into a greased and lined cake pan. Bake at 180°C (350°F) for about 50 minutes. Suggestion: Ice with caramel or coffee icing.